During the 19th century there were many schools in North and West Melbourne and those we still have today are descendants of some of those early schools. St Mary’s Primary School was in Victoria Street in the red-brick building now occupied by Simonds College. One of the first principals of St Mary’s was a former convict and a man Whose life reﬂects some of the political struggles of his time. The Hotham History Project would like to thank Crenagh Kelly for preparing the following article. Cornelius O’Mahony was the head teacher of St Mary’s School in Victoria Street, West Melbourne, during 1877 and 1879. He had arrived in Australia some 10 years before in somewhat inauspicious circumstances. Cornelius was born in Ireland in 1840. He was the son of Thomas O’Mahony, a bootmaker from the town of Macroom, which is in the south-west of Ireland in a district rich in mythology and history. When he was in his 205, Cornelius joined the Irish Republican Brotherhood and, as secretary to one of the chief organisers, travelled the country encouraging support for the Fenian uprising planned for 1865. At this time, his great contribution was to set up a newspaper, The Irish People, which was sold in Ireland and overseas. It was so successful that in 1865 there was a round-up of the people at the ofﬁces of The Irish People and O’Mahony was taken before a Special Commission and sentenced to five years’ penal servitude. When he had served 18 months of extreme hardship in British prisons, he was selected as one of the 62 Fenians to be transported to Australia. He was 27 years old when he sailed from Portsmouth in October 1867 on the prison ship ‘Hougoumont’. In an effort to ward off boredom and lift their spirits, the convicts on board decided to produce a newspaper on the way. No doubt Cornelius’s earlier activity made him one of the leading lights in this enterprise. A Protestant Fenian among them suggested the title The Wild Goose. This was very suitable as it was a name given at the time to Irishmen who were forced to ﬂee their own country and who fought for freedom in armies in Europe. It was a priest who found them the paper to write on and between November and Christmas they produced seven handwritten issues. All were in copperplate with ornate headings and included poetry, prose and Irish tales both old and contemporary. Needless to say, the authorities on board found and conﬁscated most copies but one was discovered in the Mitchell Library in 1968 and a facsimile can now be viewed in the National Library of Ireland. The ‘Hougoumont’ arrived in Fremantle early in 1868 and the Fenians were housed in the Fremantle Prison and set to work alongside criminal convicts building roads for the new colony. By good fortune, at the end of the year Cornelius was granted a ticket-of—leave and in the following year received a free pardon. He remained in Western Australia for the next nine years and was appointed head teacher at a Catholic boys’ school in Perth. During this time he married. His wife was Mary Butler, a milliner from Perth. Their wedding took place in the Catholic cathedral in Perth on 27 September 1874. Cornelius had kept up his relationships with fellow Irishmen from the past. The best man was Joseph Nunan, 3 Kerry man, who was also an amnestied Fenian. In 1876 Cornelius is mentioned in the Fremantle police records as he came under suspicion for assisting in the escape of several military prisoners. Some of the Fenians who had come out on the ‘Hougoumont’ were not as fortunate as Cornelius and were still imprisoned. The story of the effort to rescue them is now famous, as it involved the collection of funds in America, the setting-up of a whaling ship, which came from Massachusetts to Western Australia for the purpose, an organized break-out from the prison, a dangerous rendezvous further along the coast and out at sea, and a near confrontation with the British navy. The incident is remembered by the name of the rescue ship as ‘the Catalpa rescue’. Perhaps he wanted to get away? In the following year, Cornelius, Mary and their two children came to Melbourne and he now took up his position as head teacher at St Mary’s. Records of the time show that he was considered a man of talent and reﬁnement. No doubt his health would have been somewhat compromised by his time in prison and his work on the road gang but he contracted typhoid and died at the age of 39 on 5 March 1879. His tombstone wrongly records his age as 41. The Catholic community in North and West Melbourne was focused on education and schooling. The Advocate, an inﬂuential Catholic newspaper of the time, cites many instances of activities undertaken in relation to the school. Even though Cornelius had been in the post for less than two years, it was felt that he must have a ﬁtting monument, and an Art Union was held at the Hotham Library to raise funds. 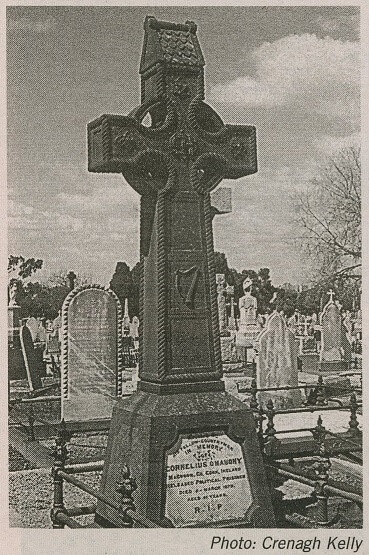 The cause for Irish independence was strong and a group of Fenian admirers organised by a close friend, Hugh Brophy, bought a Fenian plot in the Melbourne General Cemetery. In 1880 a sketch of the proposed monument was presented to a meeting at St Mary’s. It was to be a large, bluestone Celtic cross. In the same year and reﬂecting some of the same sentiment, the children at the two local Catholic schools took none of their annual prize money but instead donated it all to the Irish Famine Relief Fund. To mark the centenary of Cornelius O’Mahony’s death, a commemoration was held at the Melbourne General Cemetery on 4 September 1979. His daughter, Hanora Mary, had never married. His son, O’Connell Daniel, had married Evelyn Mary Glowery, and one of their five children, a Loreto nun (Sister Mary O’Mahony) was there to lay a wreath on her grandfather’s tomb. Next year will be the 130th anniversary of his death. by Crenagh Kelly, September 2008.